CMS stands for content management system which are platforms designed to help users create, edit and publish content on their websites. Before CMS’s became popular most websites were static HTML pages that required a web developer to perform any updates. A good CMS solves this issue and allows users to manage the content on their website without any technical or coding knowledge. As well as content editing most CMS platforms now have the ability to control or adjust the appearance of your website or even add additional functionality through extensions or plugins. WordPress is by far the most popular CMS out there and powers more than 33% of the entire web at time of writing. WordPress began life in 2003 primarily as a blogging platform but over time has developed into a fully featured CMS. WordPress is free and open source and has a huge community of developer support. WordPress has a huge directory of plugins which you can use to extend the functionality of the core CMS and thousands of themes to change the look and feel of your WordPress website. Due to its great user experience and popularity WordPress has become the go to CMS of choice here at the Creative Coop. Drupal is the next most popular open source CMS on the web, powering 2.3% of all websites worldwide. It began as a message board, then was released as open source in 2001 and since then has evolved into a powerful CMS and web building framework that has focused on a flexible and highly extendable architecture. 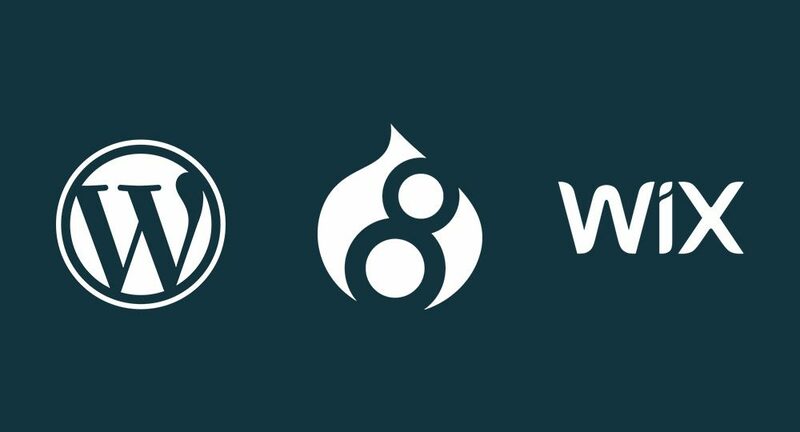 Modules and themes for Drupal tend to be free (as opposed to the large market for premium themes and plugins for WordPress) and in general Drupal is better at delivering powerful, complex and more “application-like” websites. We use Drupal particularly for websites containing complex custom applications such as, for example, business diagnostic tools and grant management platforms. Joomla is another free open sourced CMS which was developed by Open source matters in 2005. Joomla may seem a little more complex and less user friendly than WordPress but it does come with more out the box functionality without the need to install plugins which some users may find useful. Joomla is often considered to be the middle ground between the user friendly simplicity of WordPress and the feature rich but complex Drupal. Joomla is designed as a community platform and is therefore very well suited to social networking and ecommerce websites. Shopify is web application specially designed to for users looking to create ecommerce websites. Users can quickly setup an online store by selecting from a range of templates and customising using a range of options to fit with their brand requirements. The fundamental idea behind Shopify is to allow users with zero coding knowledge to setup an online store in turn however this restricts the user to the functionality and customisation options provided. Shopify is not open source like the options above it is a software as a service (SaaS) which you pay a monthly fee for without ever actually owning the product. Wix is a self-contained website building tool which was founded in 2006 with the aim to allow users with no technical background to create a website. Like Shopify Wix is not open source software and all Wix websites must be hosted on the Wix servers for a monthly fee. Users are presented with a number of pre built website designs to choose from with a series of options which they can customise to suit. Wix uses a drag and drop page builder system unlike for example WordPess which uses templates which you can apply to different sections of your website. This means each page on you website must be built separately by dragging and dropping elements onto the page which can be a much longer process if you have a lot of content. Ultimately there is not a definitive answer to this question, each of the platforms listed above has their pros and cons and it is about selecting which one best suit your needs. We find many of our clients feel comfortable in WordPress, and this is our default option for the majority of websites. Our clients may have used it before, but if they haven’t, the superb user experience makes it very easy to pick up. As I mentioned earlier WordPress started out as blogging platform that developers have taken and has now become a CMS that can be moulded into almost any use. WordPress places great emphasis on backward compatibility, making it easier to build, update and maintain with zero knowledge of code. The downside is that its very simple database structure makes custom functionality harder to build – meaning, paradoxically, that you need to write more code to do quite simple things if they are not offered as part of the available options in your theme or plugin. There are projects at the Creative Coop that lend themselves better to Drupal, these tend to be the larger feature heavy projects that Drupal does a great job of handling almost out the box with their ecosystem of free contributed modules. Building custom applications, providing many different ways of viewing and filtering content, and meeting complex client requirements is easier with Drupal, due to its more powerful architecture and database structure. Over the years we have built up a large “bag of tricks” with Drupal that serves us well. On the downside, Drupal is increasingly aimed at the enterprise market and has become more difficult for non-developers to use and update. Finding Drupal developers can be harder than finding WordPress developers, and delivering a Drupal site will typically be more expensive. Joomla fits somewhere between these two platforms which is, strangely, why we don’t use it here. For us it doesn’t have the ease of use of WordPress and isn’t as powerful as Drupal; but I am sure that for certain projects Joomla may be the perfect fit providing the right balance of functionality and user experience. Platforms such as Shopify and Wix also have their place in the market too. While they do not provide the flexibility we want to offer our clients for individuals looking to get that first online presence on the web they can be great options for people with a tight budget. If you would like to talk to us about the best CMS for your project please head over to our contact page and get in touch.